Right from the startups business to big enterprises, every business is different and required different solutions to cater to the requirements to its target audience. Due to advancement in technology, demands of the customer are also increasing because of rising technology. To accomplish the emerging demand of customers, On-demand app has come in the market. On-demand apps have become the reason for the success of many companies. 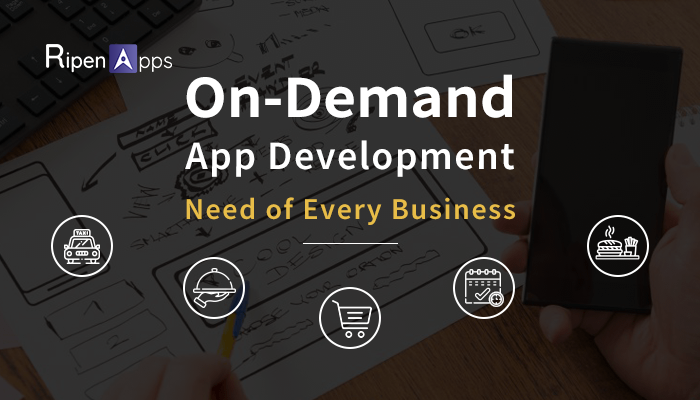 Currently, most of the startups & big enterprises are expanding their business by attaining on-demand mobile app development. On-demand app’s popularity can be seen in various industries including, healthcare, electronics, E-commerce, and many more. It helps not only mobile app development companies to attain success but also helping mobile app developers to walk on the path of success. Do you understand why it is also necessary for your business also? What Is On-Demand Mobile App Development? In simple words, the development of the custom mobile apps which is used to avail services or products on demand or at any time known as on-demand mobile app development. What Makes On-Demand Apps Successful? Easy & early assessment of the services makes on-demand apps more usable & handy for the users. If we talk about the popularity and requirements for the on-demand app then how can you forget about Ola and Uber? We believe that you must aware of the mentioned apps. Manu of us is using this for our frequent taxi booking service. There are also many apps that accomplish the daily requirements of the users at their doorsteps including- ordering food, calling saloon at home etc. People find easy to get their required services at their doorstep & Smartphones has turned out as a boon to availing those services effectively & instantly. That is the reason most of the mobile app developing companies are moving towards on-demand mobile app development. Provide easy-to-use interfaces so that business’s buyers can log in or sign-up easily. It lets the user avail the online services in few spans of time. Ease in order tracking & delivery management. Provide with Online & secure payment gateway. It takes minimum 30 minutes to avail any on-demand service and rest depends on the type of services. It gives benefit to the user as they are attaining their services in no time as well as offers benefits to the business firms by making their business popular and high ROI generating by fulfilling the demands of users in no time. Most of the businesses have their transport medium, so it does not take extra capital from the company. Apart from this, users believe that online delivery will be cost effective for them rather than going to the market and buying the items. It will save cost, time & efforts as well. The process of ordering any online services through on-demand apps is much easy. All you need to do is place an order, select the mode of payment, mentioning address, and guess what- order is at your door. See how convenient it is. Which Business Sector Needs On-Demand App Service Integration? Well, if you ask which business sector does not need on-demand service than it could be easy to say “None.” However, if you are asking which industry needs on-demand app integration, then we would instead say each business whether is food business, beauty products providers, Taxi booking or education related require on-demand apps to make their profit double. Around 242000 orders process on a daily basis. We believe that you have understood all the benefits of on-demand app development but if there is any corner have left with quarries in your mind, talk to us for more detail.